In the second installment, Liu Kang has won the tournament and Shang Tsung returns to his home dimension of Outworld, defeated. He begs his ruler, Shao Kahn, for another tournament, this time in Outworld. Kahn agrees and gives Tsung back some of his youth while Raiden gathers a new batch of fighters. As a result the cast of 12 characters is made up of half Earth realm fighters and half Outworld fighters. In addition, all backgrounds take place in the demonic realm of Outworld, giving a slight cartoon feel to the previous game. While the game was in development it was decided that the motion capture sprites would be replaced by chroma key implementation (an effect that allows multiple layers into a moving object). This technique resulted in more muscular and shiny looking sprites, which helped to remove the reality feel of the first. Finally with extremely violent fatalities and joke finishers the game gave a distinct “not too serious” impression on what originated as a very dark theme. 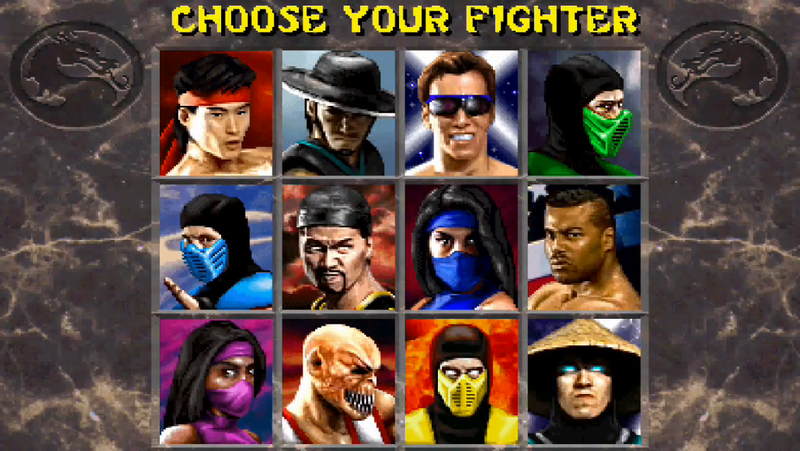 All of the original fighters were planned to be in the sequel, but memory limits claimed the deletion of Sonya and Kano and in their place Reptile and Mileena were added. For those that wonder why the same number of characters can take up less memory, these are all palette swaps with already existing characters and thus require much less space to implement. This also explains why secret characters Jade (a green palette swap with Kitana), Smoke (a gray palette swap of the various ninjas), and Noob Saibot (a shadowed black version of the ninja template) all originate with other characters. Extreme attention to detail was taken and this is clear with the inclusion of Kano and Sonya in the background of the Kahn’s Arena stage as well as plenty of secrets held within the game. We’ve already mentioned them, but each character this time around two fatalities, a stage fatality (used on the Tower for spikes above and the Pit II for cement below), a friendship that gifted the opponent in some way, and a babality that would turn the opponent into a crying baby. The Acid Pool level also had a way to uppercut enemies into it, however this move was specific to that level as opposed to stage fatalities that were specific moves for each character. 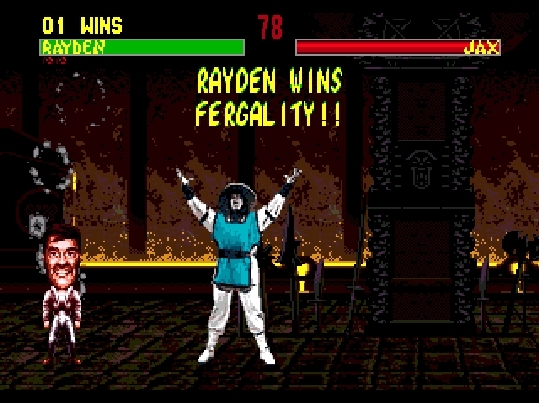 Rumors of “animalities” sprang up with Liu Kang’s second fatality dawning a large dragon that bit the opponent in half, which may have later led to the inclusion of these finishers in Mortal Kombat 3. Each secret fighter had a specific way to fight them and they all posed difficult threats just as Reptile was in the original – side note: Noob Saibot’s name derives from taking creators Boon and Tobias backwards. I still remember the day this first came out and in an instant dethroned the original Mortal Kombat as an arcade gem. No one touched the Mortal Kombat cabinet if MKII was there, even if it meant waiting in a long line. This also started the collecting and passing around of moves and fatalities – with the Internet not mainstream we actually had pieces of paper that we would bring with us to collect everyone’s moves – and was a true testament to word of mouth. While we all still picked up the original for playing at home, Midway had found a way to get us to the arcades just as often as before. As expected, when the game came to home consoles a year later, there wasn’t a video game system owner that didn’t want it and this time around Nintendo wouldn’t make the same mistake. As was the case with the previous game, Probe would be responsible for the Sega ports including Genesis, Game Gear, and now 32x. Since the Genesis was expected to be the lead platform and the largest performer – remember that although the SNES version was technically a closer port, many gamers had opted to get a Genesis for the original and would then get the sequel on that console as well. This time around there was no blood code to unlock and tons of secrets were included in the game with everything from one button fatalities to the infamous “Fergality” (you could enable the “Oooh Nasty!” cheat and play as Raiden on the Armory and make Probe CEO Fergus McGovern appear). This version was faster performing than even the arcade version due to its strong processor and visual limitations, but the game did look rough around the edges. In addition several things like backgrounds, winning animations, and sound effects were cut or changed from the arcade version. For most gamers, though, this didn’t seem to matter as the game’s fighting mechanics were spot on and the six button controller closed the gap that some users of the first game complained about. Probe’s 32x port was supposed to significantly improve the sound and visuals, creating a more complete version of the game, but after playing it I have to say it’s pretty much the Genesis version. A few sound effects are included and all the winning stance animations are now intact, but hardly worth it for the advertised improvements. The SNES version did look and sound extremely close to the arcade counterpart, especially given that all the blood had returned to the game after lackluster sales of the original (in Japan the blood was changed to green and fatalities were performed in black and white). Not only that, but Nintendo was so scared of consumer backlash for the violence that the game had not only a large “M” rating in accordance to the ESRB, it also had a large warning label from Nintendo warning of the extreme violence. Although there were some bugs in the original release (you couldn’t face Noob Saibot, for example), they were fixed and updated by the second release window and I never heard any of my SNES friends complaining. For those of us in the Mortal Kombat gaming scene, this was the version to grab. Mortal Kombat IIon the SNES also broke the mold on how violent games on the console would be moving forward. With Probe on board for both portable iterations and Nintendo laxing its rules on violence, there was a degree of brutality in each version. The roster was stripped by four fighters, obviously the palette swapped characters all making it into the game, and each character had one fatality and oddly enough a babality. Both the Gameboy and Game Gear versions were identical save for the addition of color, blood, and a few extras in the Game Gear version. Some of the fatalities in both versions were altered slightly to re-use animiations for the sake of storage space. For what they are, both games are an achievement on their respective consoles. Interestingly enough, this game was also re-released on PC, Sega Playstation, and Sega Saturn a couple years later. While we did not get the Playstation version, most of the disc-based versions of this game were plagued with sound issues because Probe didn’t make the tracks into redbook audio (or CD tracks) and instead included synthesized data on the disc. Furthermore the game would completely freeze up with the MK dragon in the center as it loaded each character’s morph with Shang Tsung – the Sega Saturn version allowed you to pre-load a few characters before the match and it would also allow palette-swapped characters even if not selected, thus granting the player at least half the roster when selecting Shang Tsung. Aside from those minor hiccups, these ports are extremely close to arcade faithful. You can also find this game on various other platforms like the Midway Treasures Collection Vol. 2 on Xbox, PS2, and PSP, as well as an unlockable for completing the PS2 title Mortal Kombat: Shaolin Monks. For a brief period of time a completely arcade faitful port was released on the PS3 as a downloadable PSN title, complete with online play, but it was removed once licensing with Midway expired. Now you can find the game in the download title Mortal Kombat Arcade Kollection on XBLA and PSN, which includes the first three games all enhanced with online play. This game was one of the first to be banned in Germany (we covered many banned games around the globe here), and Jax’s arm rip became one of the official bloodiest moments in gaming history by IGN as well as one of the goriest games of all times in an issue of EGM (1995 buyer’s guide). Another interesting controversy surrounded something that wasn’t even in the game: the rumored “nudality” or “sexality” that many spoke of as being an unlockable feature in the game. Now I can scoff that off as proposterous, but back in the arcade days when we were discovering different secrets left and right, it sure seemed possible. Sorry, not sure what you’re referring to. Please be more specific and I’ll make the proper updates.